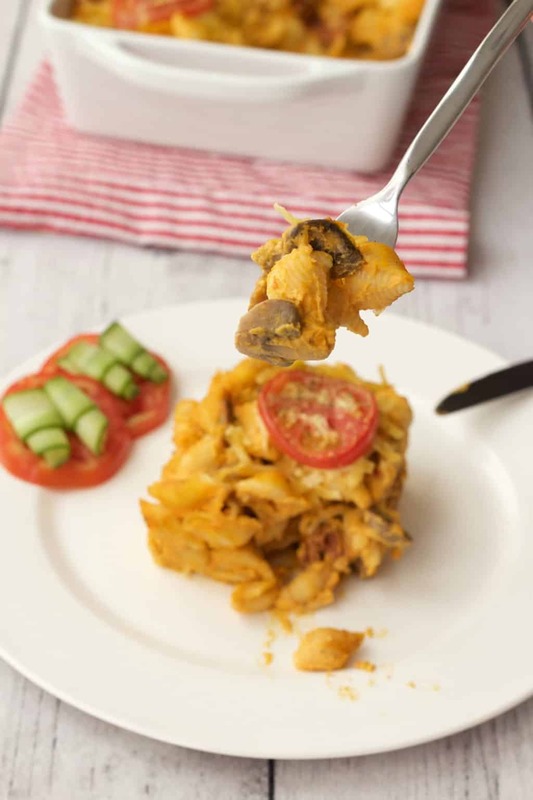 What I love about this cheesy butternut and sundried tomato pasta bake is just how CHEESY it is! And while tasting incredibly rich and cheesy and gourmet, the actual ingredients are really quite plain and simple! The overall result is a pretty low fat dish! Which you would never guess from the taste, which is quite the opposite. 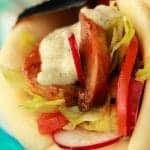 There are quite a few steps in this recipe and it’s not ridiculously quick to make, taking just over an hour in total. But in spite of this, it IS ridiculously easy to make. And once you have it nailed down, it’s something you’ll want to make fairly often. It’s one to impress the guests at a dinner party for sure. 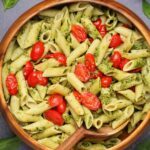 Serve it with a giant salad, some fancy bread and some nice wine and it’s a very impressive meal (tried and tested!). 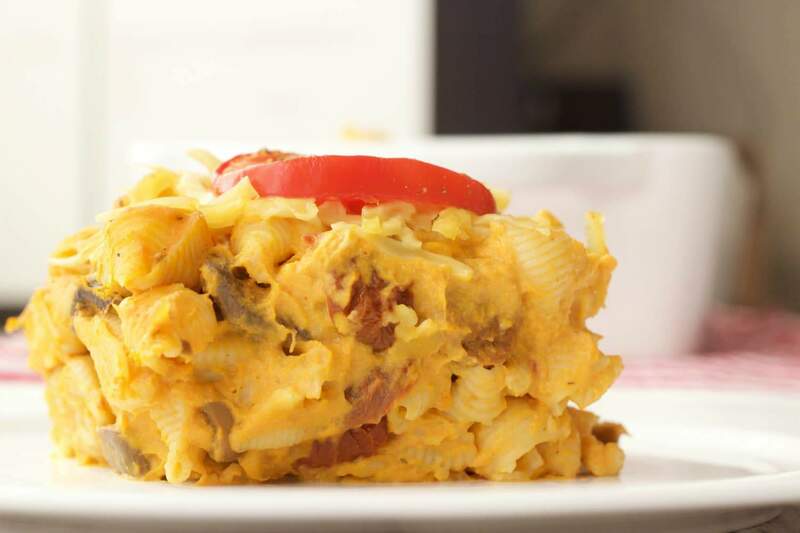 The first step to prepping this pasta bake is to peel a large butternut. Slice it into pieces and put it in the steamer to steam for 35 minutes. 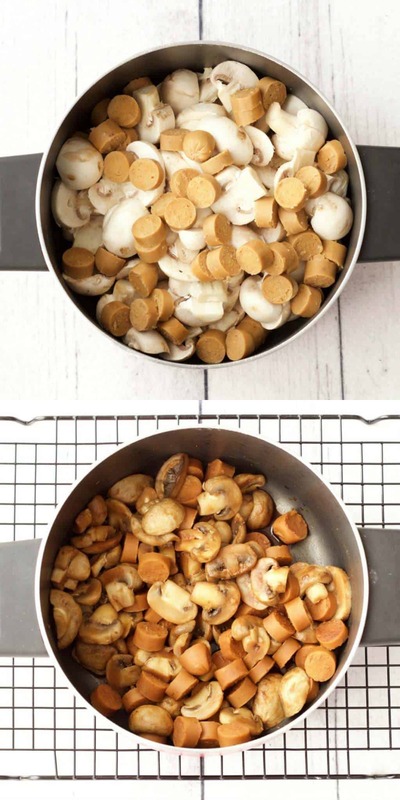 While that’s on the go you chop up two packs of button mushrooms, 4 tofu dogs (or other veggie hot dogs of your choice), and throw that in a pot with a little soy sauce. While that’s cooking, throw on some pasta shells to cook. When that’s all cooked, set it aside, while you get to work on the ‘cheesy’ part of the ‘cheesy’ butternut sauce. Throw some cashews, nutritional yeast, garlic powder, salt and paprika with some water into a blender and blend. As soon as the butternut is cooked, add it to a pot, pour over the cashew sauce, and blend with a handheld immersion blender. 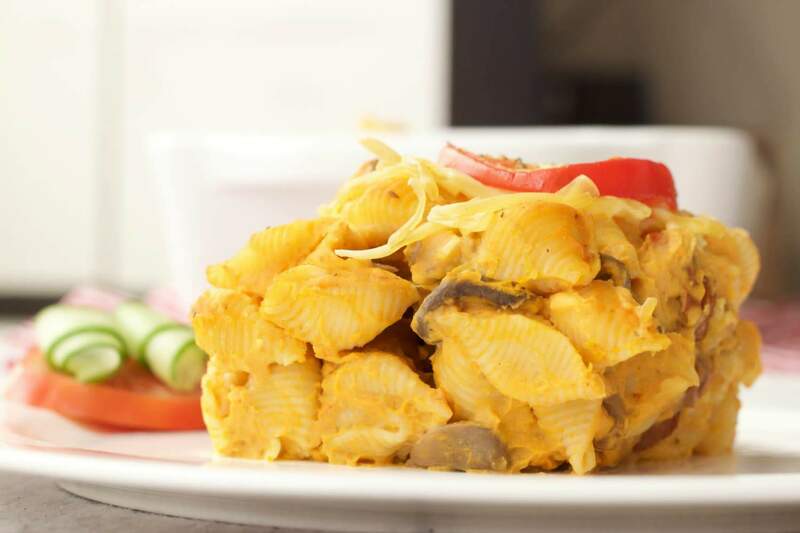 Then you just throw the cooked pasta shells in with the cheesy butternut sauce. Add the cooked mushrooms and tofu dogs, and chop up some sundried tomatoes and mix them all in together in the pot. 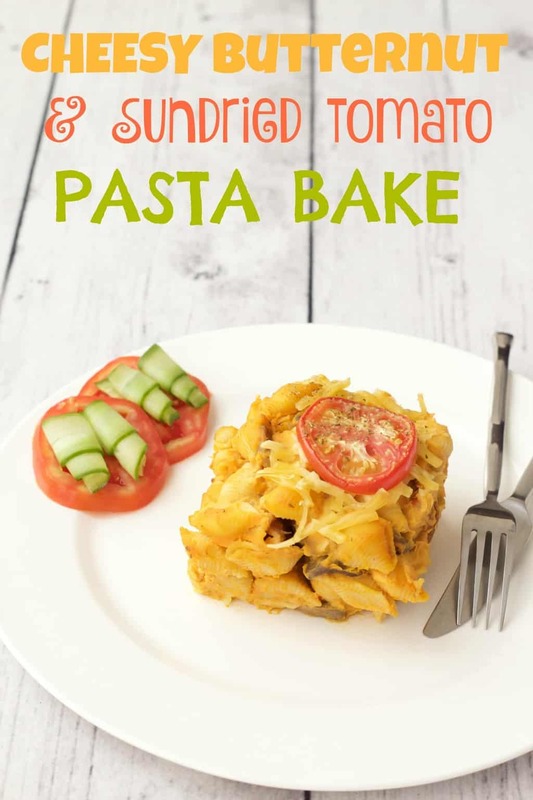 Transfer to a rectangular oven dish, sprinkle on some grated vegan cheese, add some sliced tomato and black pepper and any other dried herbs you like, pop it into the oven for 20 minutes until perfectly browned on top. And there you have it. 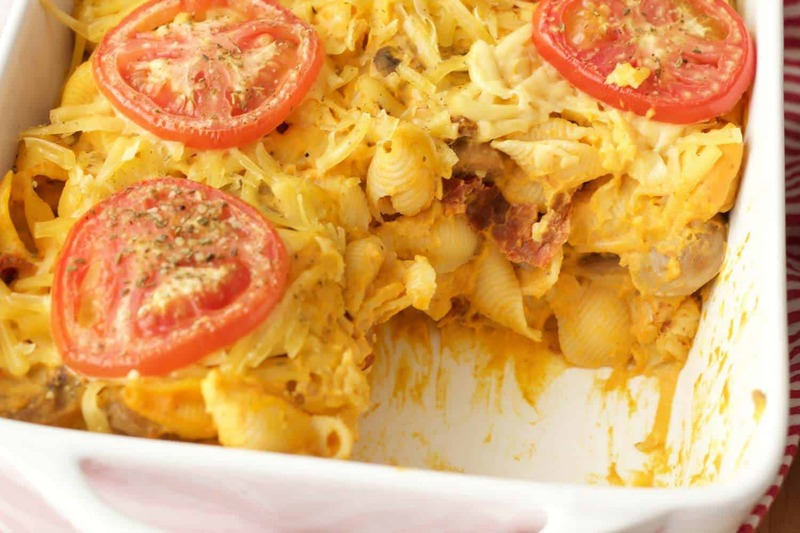 A delicious pasta bake that will serve 8! And if there are only 2 of you (like in our house), then just have it for lunch and dinner two days in a row. It’s so good you really don’t mind! And it travels well, so you can take it to work too. So even though it’s NOT super quick, it IS super easy. And packed with veggies and healthy fats. 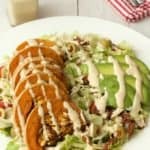 And you will seriously not believe how well the butternut and cashew cream sauce combine to make the most satisfying cheesy flavor! 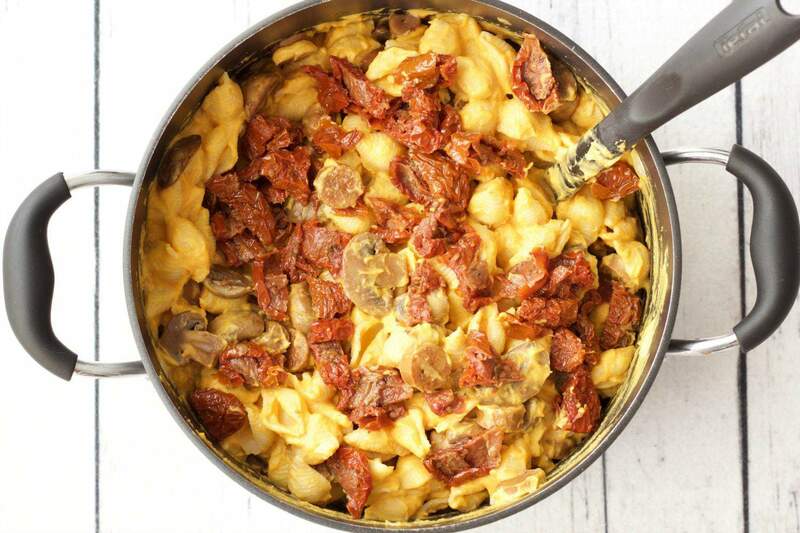 And the saltiness of the sundried tomatoes is an added layer of delicious in this pasta bake. Not to mention the tofu dogs and mushrooms! 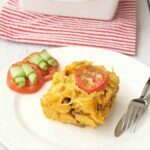 You will love this meal for its fabulous cheesy flavor, veggie packed goodness and rich taste! 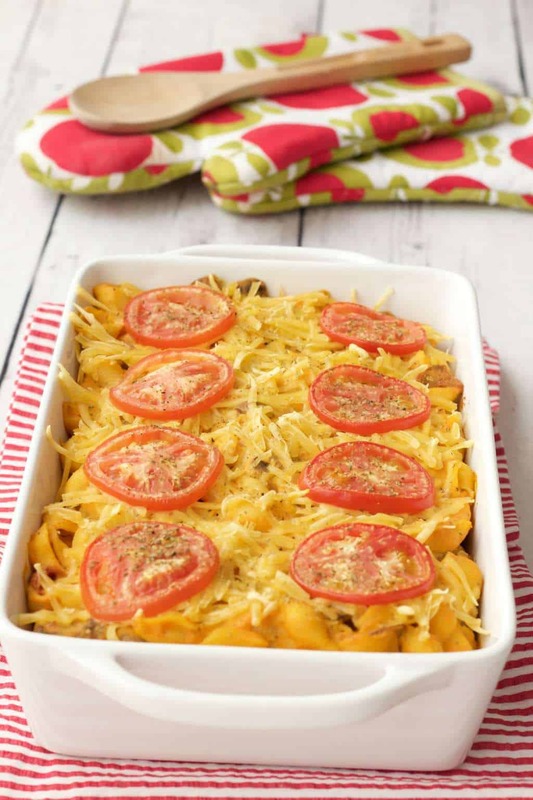 So let me know what you think of this cheesy butternut and sundried tomato pasta bake in the comments! Rate it and let us know how it goes when you make it! 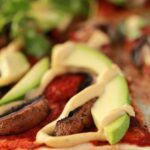 And as always we’d love you to tag us #lovingitvegan on instagram so we can see your gorgeous kitchen creations! 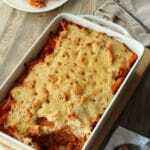 Super cheesy butternut and sundried tomato pasta bake. Perfect for a dinner party served with fancy bread, a huge salad and some good wine! 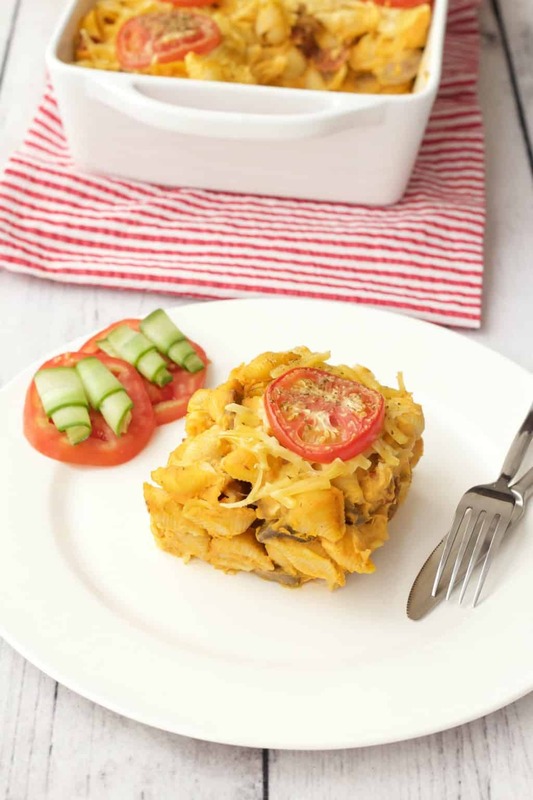 Deliciously cheesy, yet this pasta bake is entirely dairy-free and vegan! 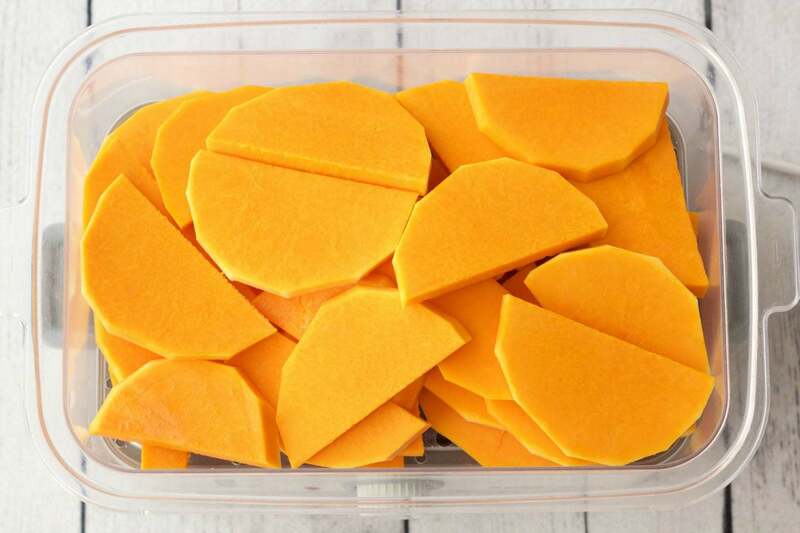 Peel and slice a large butternut and put it into a steamer tray to steam for 35 minutes or until soft and cooked. 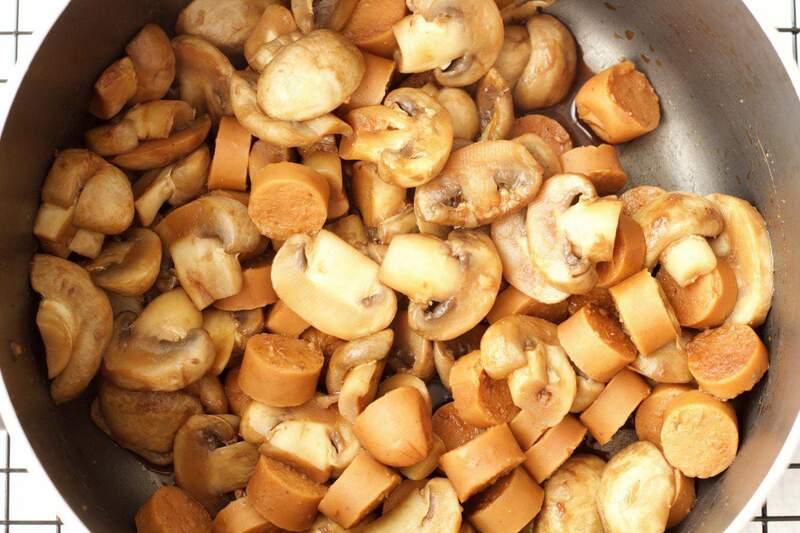 While the butternut is steaming, chop the mushrooms and tofu dogs and add to a pot with 1 Tbsp Soy Sauce. Cover the pot and turn to medium high. 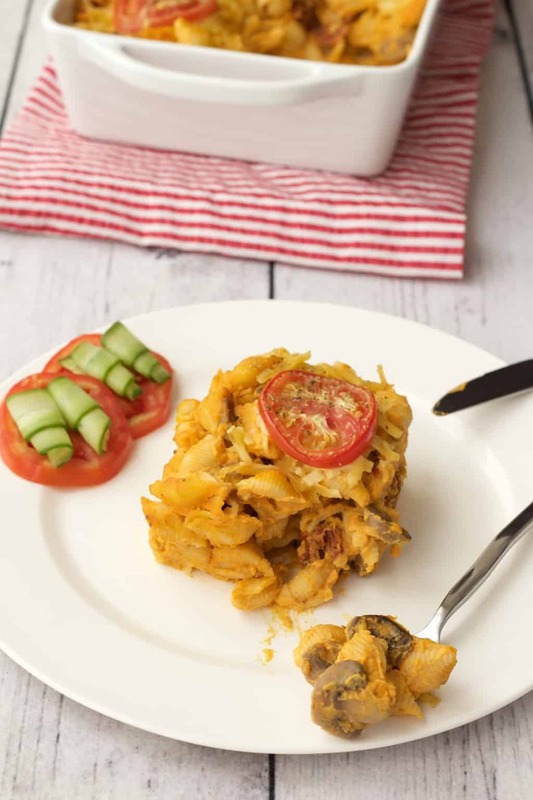 When the mushrooms have released their water, remove the lid and let them cook for around 10 minutes. While the mushrooms are cooking, put the pasta on to cook, according to package instructions. 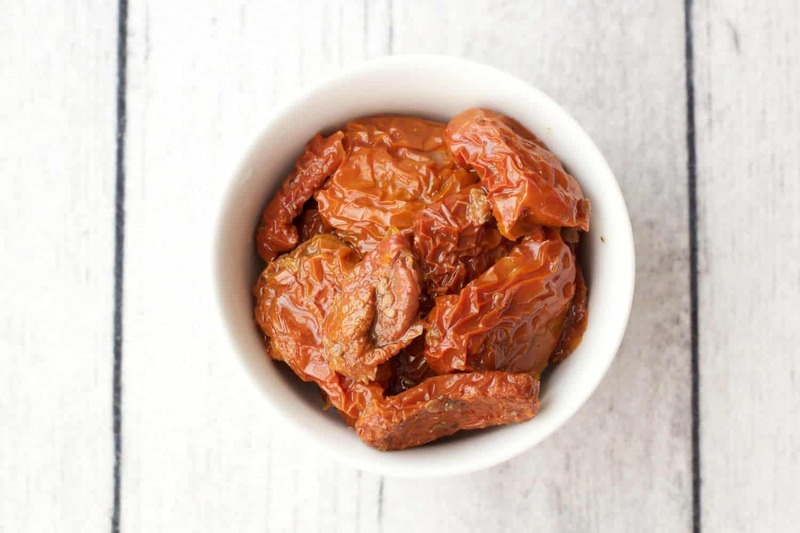 Chop up the sundried tomatoes and set aside. So now you should have your pasta cooked, your mushrooms and tofu dogs ready, and your sundried tomatoes chopped. Prepare the cashew sauce by adding the cashews, nutritional yeast, garlic powder, salt, water and paprika to a blender and blending into a cream. It will be very liquid, don’t worry, it is supposed to be. When the butternut is cooked, move the cooked butternut from the steamer into a pot. 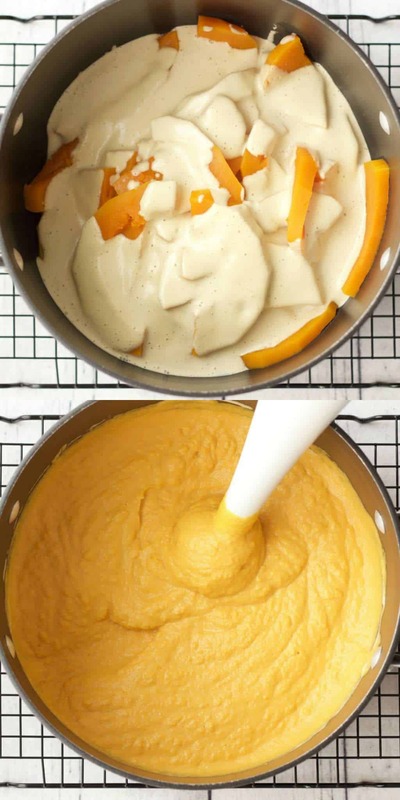 Pour the cashew cream over the butternut and using an immersion blender, blend it all together. If you don’t have an immersion blender, just use a potato masher to mash it all together properly. Then add the pasta and mix in with the butternut sauce. Then add the mushrooms and tofu dogs and sundried tomatoes and mix it all together in the pot. 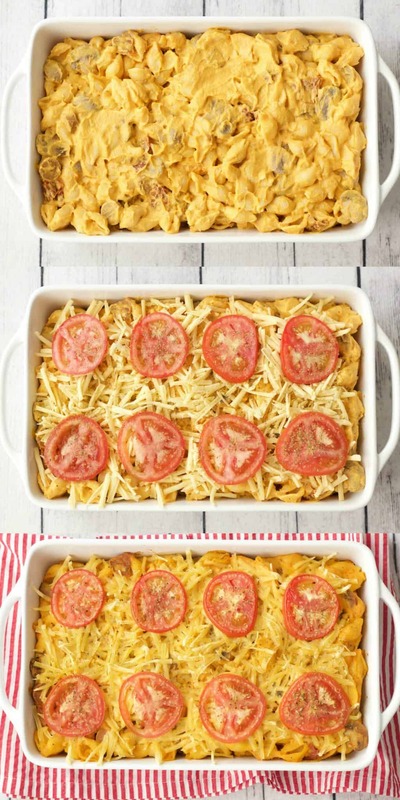 Move everything into a rectangular oven proof dish and smooth down. 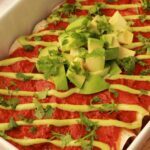 Grate vegan cheese over the top, and decorate with sliced tomato. Sprinkle some black pepper or dried herbs over the top. Place into the oven and bake uncovered for 20 minutes. After 20 minutes remove from the oven and serve. OMG this recipe is amazing. Keep it up, lovingitvegan, and thanks for the wonderful pictures! Can you mix the cashew sauce and butternut in a food processor?